A couple of weeks ago I showed you my interpretation of Monet's "Walk in the Meadows at Argenteuil" which was the work of art chosen for Art Bead Scene's April Challenge. Art Bead Scene has a blog tour at the end of the month so we can all see what everyone has been making. Please go and have a look - there are some breathtakingly gorgeous interpretations of the painting. I started by taking a few of the smaller elements from my soup ingredients and making them into a focal. There were two bead caps that reminded me of the centre of flowers so I took some of the resin fragments that I blogged about a few weeks ago and made a daisy with the bead cap at the centre. 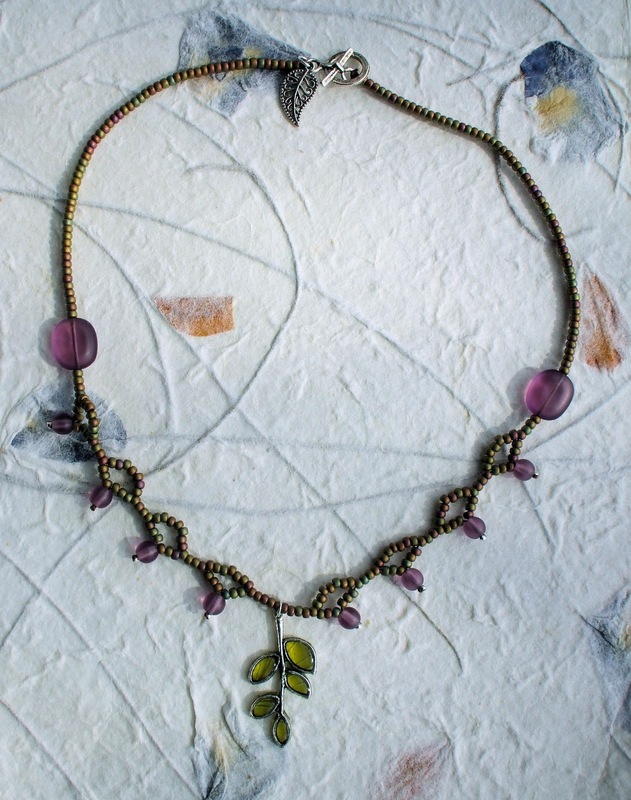 I paired this with the mother of pearl beads from my Bead Soup ingredients and some seed beads from my stash…. Jò told me that she didn’t like working with the colour orange – and fortunately, the bead soup that I sent her didn’t have any orange in it. To be honest, when I looked in my stash I couldn't find many orange beads either so I guess I have the same issue with orange as Jò. 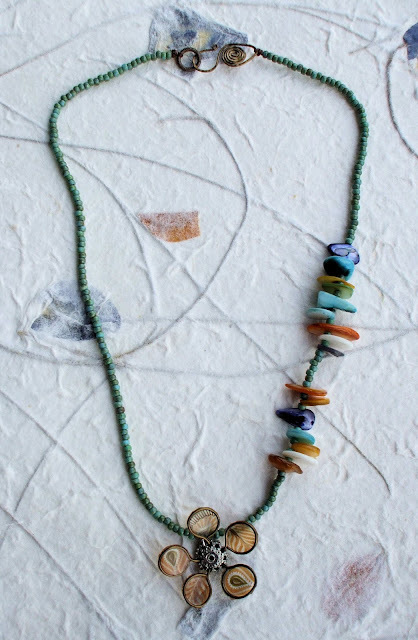 Therefore I thought, as one of the aims of Bead Soup is to expand your horizons, I should take it as a challenge to make something with orange beads. 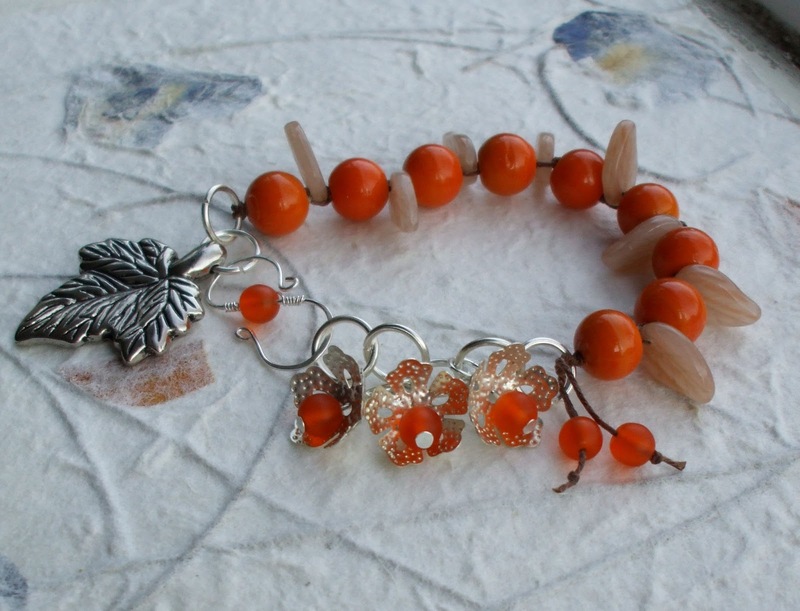 I’ve made this bracelet with the few orange beads I found in my stash (and some creamy brown leaf beads to calm it down a bit!). From my Bead Soup ingredients, I used some of the bead caps, a leaf charm and the small frosted orange beads that Jò sent…. It has been really fun working with everything that Jò sent. I was very lucky to be partnered with her! I really enjoyed the challenge of using ingredients that I hadn’t worked with before. Please head over to Jò’s blog to see what she made with the ingredients that I sent her. And please also go and see what the other bead soup participants made – there is some lovely work out there. 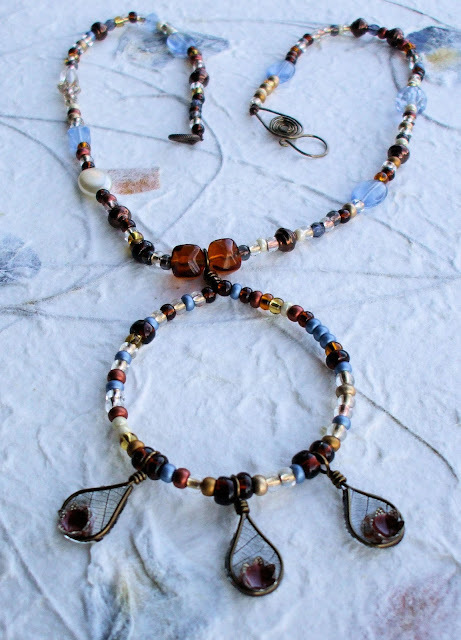 A final word to Lori Anderson – the hostess of the Bead Soup Blog Party. I am amazed at the work that she puts into this. Thanks very much Lori – I’ve really enjoyed your party!! 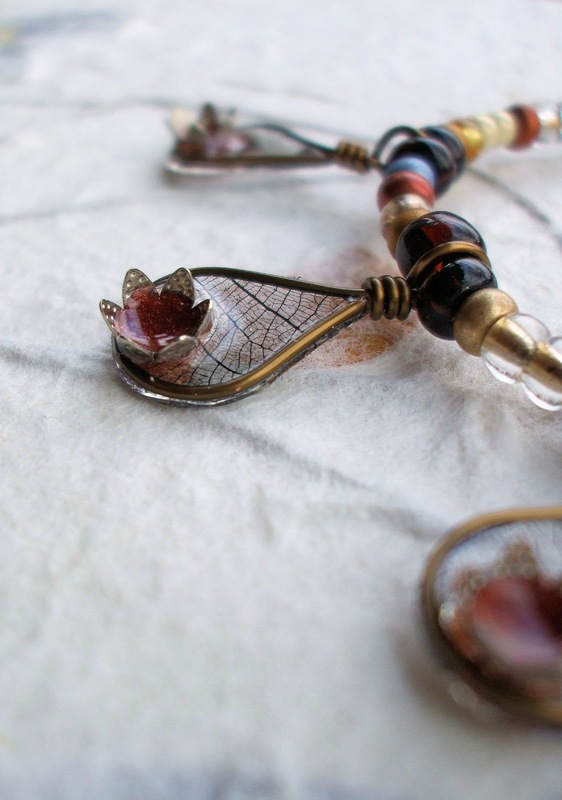 I'm a big fan of the Art Bead Scene Blog - lots of lovely beads and the work of talented designers, what is not to like! 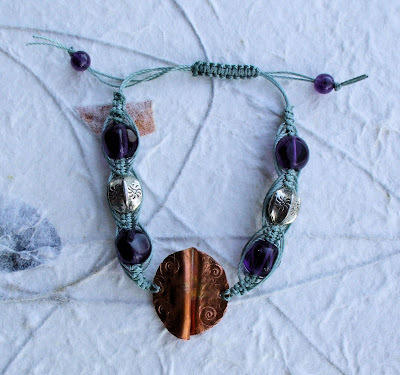 Every month they have a monthly challenge where a work of art is chosen as inspiration to create or use art beads. I've been meaning to join in for a while but with one thing and another I haven't quite managed it but when I saw this months painting I knew exactly what I wanted to make. 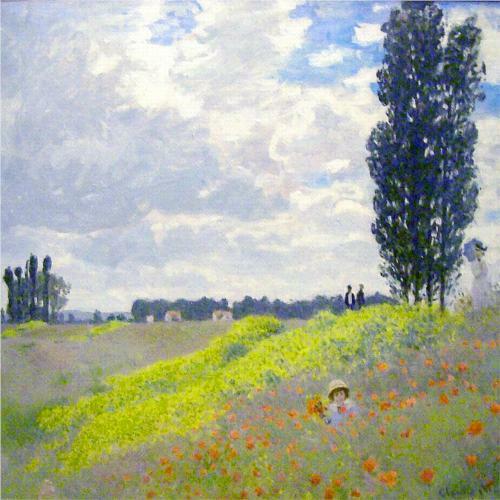 The picture is Monet's "Walk in the Meadows at Argenteuil". I've always loved this picture and what caught my eye for this challenge was the meadow in the foreground. I wanted to make a focal with strips of different colours of resin which emulated Monet's meadow. I had a lot of fun mixing up pigments to make colours for the resin that I thought suggested those in the painting. What I wanted to do was to create different sections of resin in the focal so I cut copper strips to separate the resin colours. I also decided to make some connectors using the same colours of resin, but I let the resin flow more organically in these. I used three of these connectors in the necklace and one as the clasp. 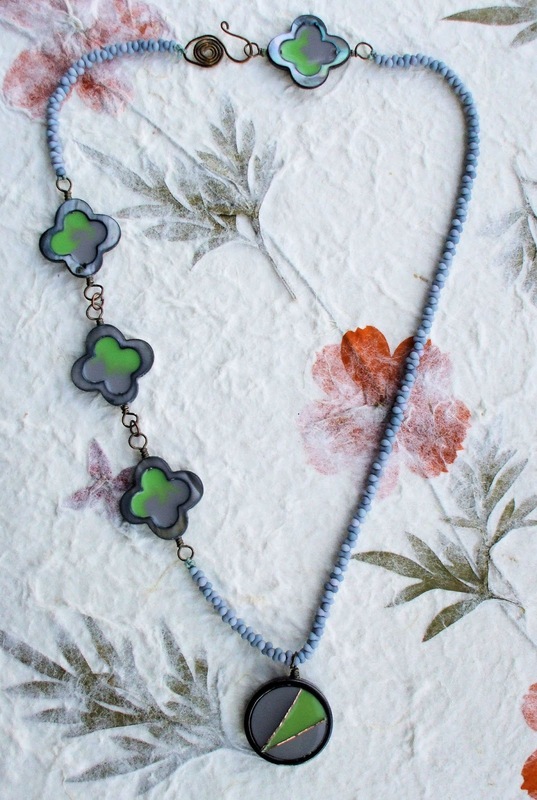 I finished the necklace off with some peanut beads. The focal is an abstract take on the painting, nothing like Monet's impressionistic style - I hope he won't mind! 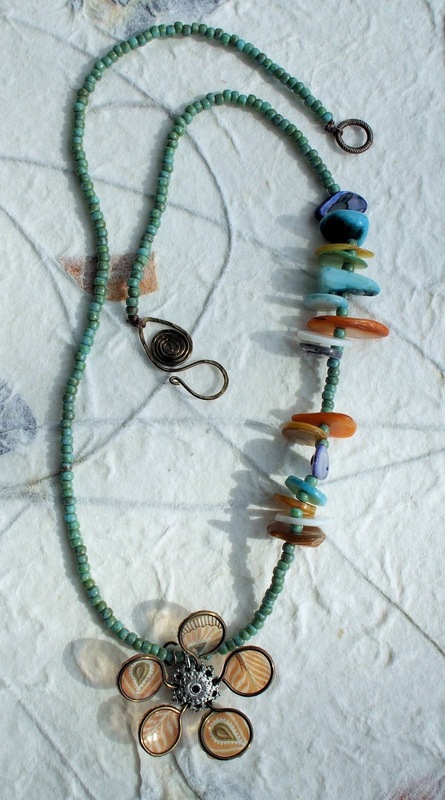 Just to let you know that my reveal date for the Bead Soup Blog party has changed. It will now be on the 27th April - please come back then. In the mean time - why not go and have a look at what everybody in the second reveal made - there is some lovely work out there. The second Boot Camp is all about texturing metal using things that you find around the house. To be honest I nearly gave Boot Camp a miss this time. Ordinarily, I go to a metal-working studio - the studio is very well equipped so I haven't needed to get many tools at home. However, I've torn all the ligaments in my ankle (ouch!) and driving (and walking!) are pretty much out at the moment. I haven't made it to the studio for a while - I'm missing it!! 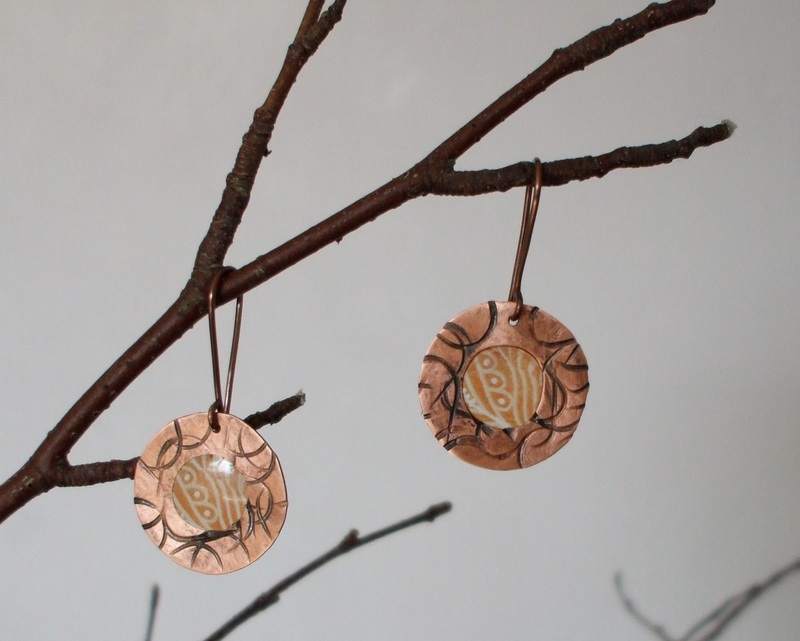 When Boot Camp came around, I thought how can I do a metal-working challenge without all the tools I normally use? But I'd had a lot of fun with the last Boot Camp and didn't want to miss out - so I decided that not only would I use household materials to texture metal, I would see what tools and materials I could find in my house too. I dug around in my household tool box and pulled out the heavy-duty hammer and a couple of copper washers. Now to find something to texture with. The answer came as I was mulling over a work problem in front of the laptop. I always fiddle with things when I do this and this time I picked up a paper clip. Eureka moment! I hammered the paper clip in a random pattern onto the washers. I cheated slightly on my self-imposed challenge of using only things I could find in the house and bought some Liver of Sulphur online to emphasise the paper clip texture. I do all my resin work at home so I had those supplies. I filled the centre of the washers with tissue paper and resin. This added some colour but because it is tissue paper it remains somewhat translucent and the light still shines through. Finally, I made some very basic ear wires and called them done. The paper clip held up surprisingly well to being battered with a hammer - though its days of clipping paper are definitely over! I'd pulled out several clips expecting to have to use a few to get the job done. But I used the same clip for both washers. So there you have it - a very simple design but the best I could do in the circumstances. I suspect I'm going to be embarrassed by its simplicity when I see the intricate work that others have done! Please take a look at what everyone has been working on. I'm pleased with what I could achieve using things from around my house - but I'm still going to be scurrying back to the metal-working tools at the earliest opportunity! I hope that you had a good Easter. Over Easter, I pulled out the resin and made a few more of the resin fragments. 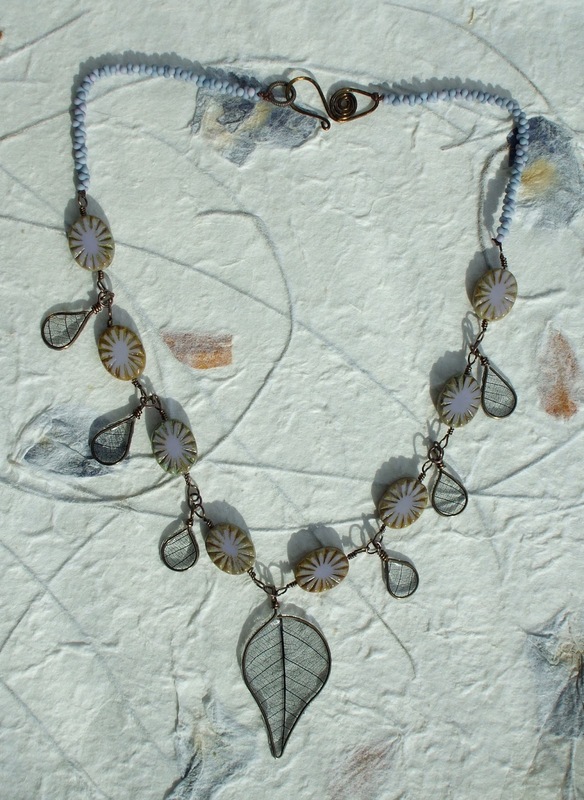 This time I used skeleton leaves rather than paper. I made quite a few (I think I'm getting a bit obsessed!). I've paired these with some Czech glass and peanut beads. I like how this came out, super-light but with impact. Over Easter, I also spent a lot of time looking at the first reveal of Bead Soup. I definitely recommend having a look, there is some lovely work out there. There are so many of us participating that Lori has split us up into three groups. I'm in the third reveal, please come back and see what I've made out of my soup ingredients on the 20th April*. *Please note: my reveal date for Bead Soup has been postponed slightly (it was the 13th and is now the 20th). 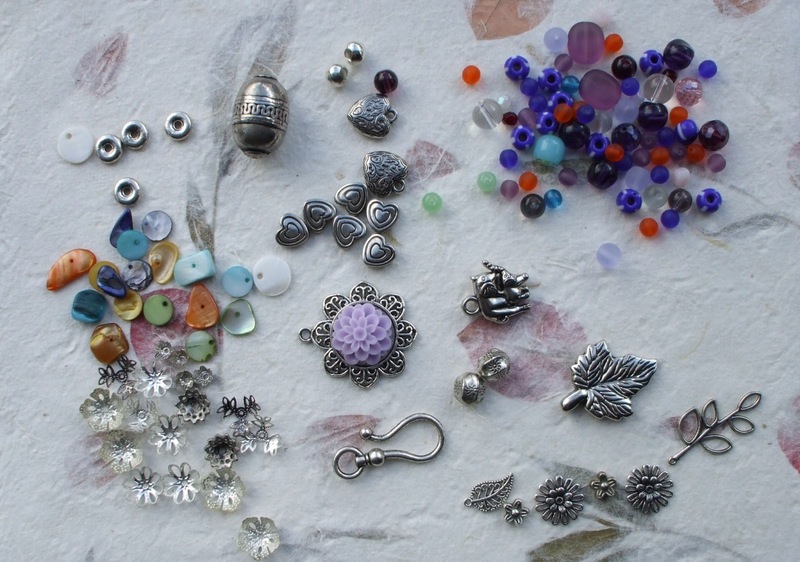 Poor Lori, who organises Bead Soup, hasn't been well recently and needs a bit of extra time to deal with the mammoth task of organising the Bead Soup Blog Party. Get well soon Lori!